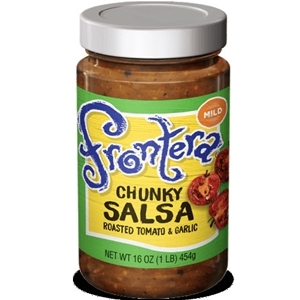 Frontera Red Tomato Salsa Mexicana Mild Salsa is a salsa with a zesty blend of roasted tomatoes, mild green chiles, roasty garlic and cilantro. It's great with tortilla chips, as a condiment on grilled burgers and sausage or over scrambled eggs. You can taste our dedication to small-batch salsa made from fresh ingredients. Tomatoes, tomato juice, filtered water, Anaheim chiles, tomato paste, onions, garlic, salt, cilantro, jalapeños, apple cider vinegar, distilled white vinegar, paprika, xanthan. Product is 100% gluten-free.